I found some time during lunch today to do some browsing on the internet. When I browse it usually doesn't involve anything fun, it is usually checking out weather.com or msn.com to find out what is going on in the world. And today I did get to google Gorgonzola, which turns out to be an Italian blue cheese made from unpasteurized cow or goat milk (Judy & I were were looking at the Chico Dining Room menu and needed to know what Gorgonzola Filet Mignon was). And what's this about Brad & Angelina? That is one of those stories that I'm ok not having to waste my brain space with. Sometimes I stumble across something interesting, such as that Yellowstone is in a Winter Storm Watch from Saturday night until Monday morning. 4 to 7 inches is expected. I am fascinated by weather and I actually use to watch the Weather Channel for hours as if it had some sort of plot. As I've mentioned, I love snow so I really look forward to a good dumping of it though it may hamper my big plans to go to Bozeman on Monday - I was getting kind of excited to actually venture more than 1/2 mile from the Park boundary. Hello to John! I hope to see you when you and your son come to the Buffalo Ranch! Yesterday on my way into work I got to stop and listen to the wolves howling off in the distance. It is a mesmerizing sound. It could put someone into a trance. I guess that is why they use wolf sounds in relaxation tapes. It was a packed Taco Tuesday yesterday. Jeff had to bring out more chairs from our break room to seat everyone. I really enjoy those days when the Fountain is busy and I get to see those familiar Tuesday faces. We also got a new espresso machine in and we all got to have a taste test and were rather pleased with the results. I just might become a coffee drinker yet. Wednesdays are another busy Fountain day when the snowmobilers come in. I can make one mean panini. This morning I went outside right into a cloud bank. It is still cloudy out but the clouds are up in the sky where they belong. The temps in Mammoth lately have been in the 20's. A nice temp for me. The Mammoth YGS gang is planning a dinner at the Town Cafe tomorrow night and another dinner in February at Chico Hot Springs. It's a pretty good group here! I am sitting in the gift/coffee/internet shop (High Country Espresso) in Gardiner sipping on a delicious mocha taking full advantage of the internet and completely happy that someone else is running the espresso machine and serving me. My travels today found me admiring the bull elk by Lava Creek. Besides bison and one coyote this was the extent of my wildlife viewing for today. We received about 6 inches of snow in Mammoth these past few days and it has been giving my broom a workout. Everything looks wonderfully white here, especially the trees with snow on the branches. I know I have commented on my lack of news in the Park and this really hit home yesterday when I found out that the Minnesota Vikings were in the playoffs. I couldn't believe that I somehow missed this important bit of information. I guess it was a good thing then I wouldn't of had days of anticipation under my belt when they lost last night. On my last trip into Gardiner (Saturday) I found a ram beside the road. As I took pictures of him Connie pulled up and pointed out the pile of sheep behind me. There were over 20 sheep in all and I thoroughly enjoyed watching them munch their cud. Simple pleasures. This is the sunrise that I saw from my kitchen window the other morning. The view I see on my drive to work every morning. My morning started out with sweeping between 4 and 6 inches of snow off my steps and car. It is so nice to have snow here. It snowed huge fluffy flakes all day yesterday and into the night. I had today off, Betty switched days with me so that her and Connie could take a snowcoach tomorrow. 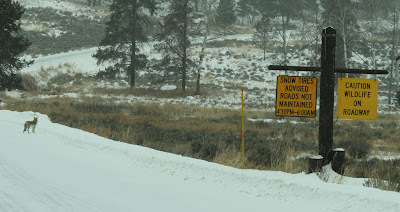 The roads were rather slick today and it became quickly evident how slippery they were when I came across a car that slid off the road on the Blacktail. It would not be the only vehicle I saw off the road on my travel to Lamar today. I also saw a truck stuck in the snow off the side of the road in Lamar. On my way back to Mammoth I came across a coyote wandering the road by the Tower Ranger Station. After I made my way past him/her a car coming from the other direction flagged me to stop. When I rolled down my window I warned her that there was a car right behind her. Having to make a quick decision the driver behind her hit the snow instead of her car. She wanted to know how much further Lamar was while the poor guy in the other vehicle was hopelessly stuck in the snowbank. She drove away and I offered to help. Luckily for all involved a guy came with a tow strap. Slippery road on the Blacktail. Elk by Mammoth this morning. I am currently sitting in an a shop in Gardiner that sells coffee and has the internet. I finally am able to upload some of the pictures that I have taken these past couple of weeks. This past week there has been an earthquake swarm between Old Faithful and West Yellowstone. And living in the Park I knew absolutely nothing about this until today. There are always earthquakes here, most are never felt. I, for one, always wanted to at least feel a tremor but I'm still waiting for that moment. This summer, when laying in bed, I could have sworn that my bed shook but I chalked that incident up to being over tired. As of 9:00 this morning there had been 1,033 earthquakes here since Sunday afternoon when the swarm began. People have felt them all over the Park and as far north as Gardiner. Earlier this week Judy heard one of these tremors - she heard her dishes rattle. Reading a news release I learned that scientists believe that this swarm is due to tectonics and not volcanic activity. Good to know. There is a link on the right of this page that will show you where, when, how deep, etc. that these earthquakes are. Yellowstone is definately one fascinating place. Though we had flurries here in Mammoth two days ago this mornings snowfall has brought the plows out. I have heard anything from four to six inches but it seems that no matter what is forecasted we only manage to get a dusting here. What snow we do get today can be directly related to the Snow Dance that Judy and Betty did here in the store the other day. We will have to see how much we get and if they have to put some more enthusiasm into their dancing. Last Tuesday the park service offered a First Aid and CPR course. Myself and three park service employees took advantage of the first class offered. It was an all day class and I immediately noticed that CPR methods have changed since I was certified about 12 years ago. I never had to use CPR (except once on a cat) and hopefully my new certification will never be needed. But in case someone falls to the floor next to me I will be prepared. I also learned how to use the AED, another thing that has been vastly improved from the gel and paddles from years gone by. My weekend in Lamar was fairly lackluster. I managed to watch a coyote by Floating Island as well as the regular guys (that would be the elk) hanging out on the Blacktail. Monday was even a slower day. It was my first day out in three months were I didn't even manage to see a coyote. I did, however, stop on a overlook in Lamar and listen to wolves across the Lamar River. I never saw them but they made wonderful music. I should mention that I will have a new position this summer. This summer I will no long be an Associate or a Dorm Lead at the YGS at Canyon as I did last year. I have recieved my paperwork for my new job: Store Manager at the Adventure Store at Canyon Village!! I will start my new position April 9 and it will end November 1. 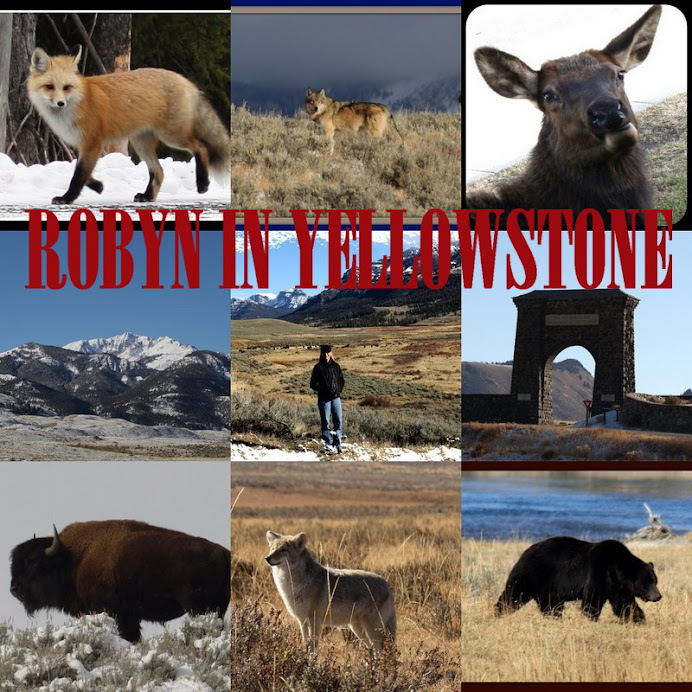 It will be a new adventure and a new challange in my Yellowstone life. I am thrilled. So now when people pop in to say 'hi' to me this summer they will need to go to the Adventure Store which is located between the Yellowstone General Store and the Canyon Visitor Center. I hope to see you there! Hello everyone! I have been receiving quite a few emails from people wondering what the heck has happened to me. I have not disappeared into the wilds of Yellowstone, I have been sitting with frustration as the Internet connection makes its appearance only to disappear again. To make matters worse my computer will not hook up at all..........my computer with my pictures on it. Great pictures I wanted to upload that include bighorn sheep, a wolf, bull elk and my friends from Dung & Dunger. Between Internet frustrations and being in Yellowstone it all seems to even out in the end......well, sort of. Pictures help to tell the story. A week ago this past Thursday I was pleasantly surprised to run into Victor, Dan and Kara from Dung & Dunger (I wrote about them this summer and I have a link to the Dung & Dunger website). The gift shop in Mammoth Hotel was having a ribbon cutting ceremony to show off their new eco-friendly upgrades and they had invited some of the vendors for the occassion. The Dung Gang came over to YGS to say 'hi' so Connie & I decided to go visit their booth after work that evening. They gave Connie and myself t-shirts to wear and have our pictures taken in when we went for pizza that night at the K-Bar. After we returned to the hotel to listen to the speeches and watch the ribbon cutting ceremony. It was a really nice evening seeing and visiting with friends. This would be the spot where I would normally post my pictures from the evening, eventually I will get my computer up and going. During pizza I recieved a phone call that my dad was involved in a car accident in Florida. He spent the night in the hospital and is healing from numerous bumps and bruises. Get better soon, Dad! I also made my weekly trips to Lamar Valley. On SundayI found myself marveling at some female bighorn sheep as they walked in single file through the snow across from the Yellowstone picnic area. I watched them for awhile as I adored the faces of the youngest in the group. This years babies are getting large but they still have faces that are still baby-like. On Monday, during my second trip of the week to Lamar, I got to watch a couple of rams across the road from the hitching posts. It's unbelievable that I spent so much time earlier this fall looking for the sheep and never finding them and now I don't even have to try to look for them. They just show up for me. Once again, I have some pictures. On my way back to Mammoth, just past the Petrified Tree, as I went down the hill and curved to the right I found myself staring right at a wolf in the middle of the road. I came to an immediate stop and watched it carefully walk across the road. I managed to grab my camera and snap a few pictures. What became immediately apparant is that I was looking at one of the wolves with what appeared to be a case of mange. The tail was nearly hairless except at the tip and the hind quarters were scarred and spotted with sores. It was terribly thin. But lacking a skin scraping and a microscope I can only assume that is what is going on with the wolf. It was a sad sight. On my return to the YCC I found that my 'yard' had a small herd of elk grazing in it. I was even awaken at 4:30 one morning when an elk decided to start whining on the road outside. It was either a very loud elk or I have extremely thin walls. I've also have been seeing the rabbit on a regular basis. It has been extremely warm, near 40 degrees, so the snow in Mammoth is melting fast. The interior of the Park isn't doing much better in the snow department. Thanks to Alan I now know the ducks I was seeing are called Barrow's Goldeneye. Thanks Alan for the info! YNP was in a Winter Storm Warning yesterday. It snowed most of the day but nothing that stuck around in Mammoth. This morning I heard the snowplows come by at 4:30 and discovered that about 3 inches fell, and this time it stuck. I was hoping for more but I will take what I can get. When I'm at work the snowplow guys plow out my parking area at the YCC for me. I am so glad for that because I don't have a shovel. I have been using a broom to sweep off my stairs and car and my broom is no match against a large area of snow. The elk have been in Mammoth lately, I am even seeing them in the mornings at the Yak. Yesterday on my way to work I had to come to a stop in the road as elk and a coyote wandered around the road. I read in the paper yesterday that a snowmobiler had been killed in an avalanche near Cooke City. A grim reminder that beautiful places can also be dangerous. It was snowing this morning when I left for Lamar. I love the snow and it could snow everyday and I would be completely happy. I saw this coyote by the Tower Ranger Station. I took the second picture because of the sign that says "Caution Wildlife on Roadway" - and there was wildlife on the roadway. In fact, I've been seeing other coyotes, besides Digit, in this exact area. I keep an eye out for them every time I drive through this area. I had seen one in that exact spot on Friday. I love the ice formation that formed on the banks of the Soda Butte Creek by Pebble Creek. In Lamar there were some bison right by the road and I watched some coyotes mousing off in the distance. Some ducks were swimming in the Lamar River (Mental Note: find out what kind of ducks those are). Though the snow is not incredibly deep the bison still have to use their power muscles to push the snow away from the vegetation. Most of the bison walk around with a snowy face. This bison has pushed the snow away. I took this picture between Floating Island and Petrified Tree. There is a pullout where I can look down on the bison (or elk, or whatever). In Lamar I watched a herd across the Lamar River run and chase each other around. When looking at bison it is hard to imagine that they would romp and play like other creatures.....but they do. Not only is wildlife watching easier in the winter but the footprints in the snow are spectacular. There is rarely a patch of open snow that does not have tracks of some sort covering the area - which includes the bottom of my stairs where I live. This morning I came out to huge wolf prints right at the bottom of them. I only found one bull elk by Lava Creek yesterday. This one I will be able to identify in the future as one of his points has broken off (his left side at the top). I would like to imagine it broke off during some mighty battle he had this fall. Side Note: I am reading a fascinating book called Mayflower by Nathaniel Philbrick. Anyone who is fascinated by history, especially the colonization of New England should check it out. He also wrote In the Heart of the Sea - the story of the ship Essex. Another excellent book. Here is the Mammoth Yellowstone General Store gang wearing their festive New Years Eve hats and having dinner at the Mammoth Dining Room. It was our belated Christmas Party and Judy had some relatives visiting so they got to hep us celebrate. Prime Rib and Cheesecake!! This picture was taken 12/28 but it accurately shows how Mammoth looks today. Lots of cars and visiting people. The store has been busy and I'm enjoying visiting with everyone. One couple who had been in the store earlier in the day on Thursday came back to breathlessly tell me about seeing a baby wolf. It turns out they saw a coyote.......and a familiar coyote. Once they talked about how it wandered down the middle of the road about 5 miles east of here I figured out they had been Trotterized. They weren't one bit upset when they found out their baby wolf was actually a coyote when they realized that I knew exactly the coyote that they were talking about. With the store closed for New Years Day I decided to head to Lamar where there have been a lot of wolf sightings these past couple of days. Coming onto the Blacktail I was met with..........Trotter. It was perfect timing as he climbed out of the ditch and onto the road right in front of me. This time instead of trotting down the middle of the road he just crossed over to the other side. I snapped a few photos and moved on. I watched a herd of bison laying in the snow by Little America and I also saw the numerous cars of those watching for the wolves. In Lamar I watched numerous American Dippers dive into the Lamar River and then pushed forward. Two days before Judy and her family had watched some otters just past Pebble Creek and I really wanted to see if they would make a showing for me. No such luck.